Cut sandwiches into triangles or squares to make it easy for little hands. English muffins make great healthy pizza bases. Split the muffin in half and use each piece as a base. Try making faces out of the toppings – this makes adding veggies more fun! 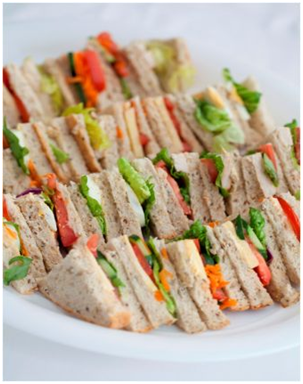 Include bread and fillings in lunchboxes and allow children to construct their own sandwich. Zebra or Tiger sandwich: One slice of white bread and one slice of wholemeal bread with your choice of toppings. It’s a great way to add wholemeal/grainy bread to the menu! Traffic Light sandwich: Two slices of bread spread with red, orange and green fillings. Cut the sandwich into fingers, and then cut three circles out of the top slice of each finger to reveal the ‘traffic lights’. Pinwheel or sushi sandwich: A slice of bread with a spread and fillings (e.g. avocado, cheese and grated carrot), rolled up, cut in half and displayed with the filling showing.